Our test had nice moments for sure, but altogether there was a bit of, uhh, inattentiveness. Pirate was too distracted with the whereabouts of his BFF Phaye to focus much attention on his rider, which means we lost silly points on such things as the second medium trot, where he tried to holla for his girl and got jabbed in the side with a spur (we actually – *gasp* – broke stride there) to snap him back to reality, and the halt-reinback at C, where he whipped his head sideways and screamed for her in the judge’s face. (This judge may still be partially deaf). I tried to explain to him the Big Bad Intermediate Horses do not NEED their mares to hold their hands in dressage, but he is still young, after all. Phaye, piloted by Ashley all weekend, was the old pro of our little group, having been my first Prelim horse. 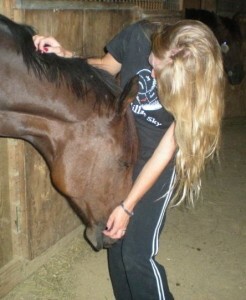 Though talented, she’s a tough ride all around, and Ash did a super job with her for their first BN. Then onto show-jumping. Baby P remembered to be a grown-up for me in there and jumped super well around a very twisty-turny course. Early on there was a tough line of three fences with a big skinny box in the middle, and going in he locked on and read the question as cross-country, which apparently means GO! to P. He jumped in and over the skinny well, but he landed running a bit and came up short to the square oxer out, taking the rail. Oops! Still, I was very pleased with him, and he was ever so pleased with himself. But here’s where Pirate got confused. We did dressage…jumped around stadium…galloped a bit around the perimeter of the racetrack…”WHY am I getting back on the trailer to go home? Where’s the cross-country?! MOM!!! You have GOT to be KIDDING me!! !” Poor fellow, having to do a CT to prep for next weekend, not even getting to do the FUN part! I made up for this slightly mean prank by taking him down to Winnsboro SC for a jump lesson with Tiffani Loudon-Meetze on Monday. She kicked our butts in the best way possible and gave us loads of advice for the weekend, and we are both feeling super confident after a great school. (If you get the chance to ride with Tiffani, do it. I’d drive down there weekly if I could). Speaking of confidence, I was super excited about the young off-track TB I rode for the Hamiltons at FENCE over the weekend. Though on the tense side in warm-up, he honestly could not have done much better for his first time out. He was lovely in the dressage and jumped well in both phases, despite the fact he’s very green over fences and has never even cross-country schooled. I’m looking forward to more outings with this promising youngster. That’s all Pirate was a few years back, after all – just a promising youngster! And when I told everyone he’d grow up to become my upper level horse someday, I’m sure theyall thought I was joking. 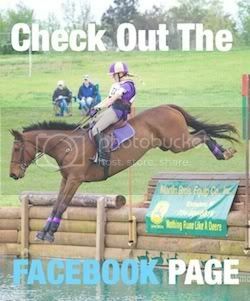 Posted in Blog and tagged with 3 Day Eventing, April fools, Dressage, equine, Horse, horse trials, Kelsey Briggs, Show jumping, The Gentleman Pirate, trainer, Tryon, United States Eventing Association, USEA. RSS 2.0 feed.